A flag? Just a flag. Is that art? Exactly the question I’m asking every week, for a short piece in the weekend supplement of the newspaper I work for, zooming in on a work of art. In one of the last episodes before the summer break I focused on this flag, by Stijn Cole, after I’d seen a picture of it. So when I finally stood in front of the actual flag, I knew what the Belgian visual artist had done to create it. The concept behind it. But being there, in the front-lawn of the castle of that small Belgian town of Chimay, looking at it, changed everything. 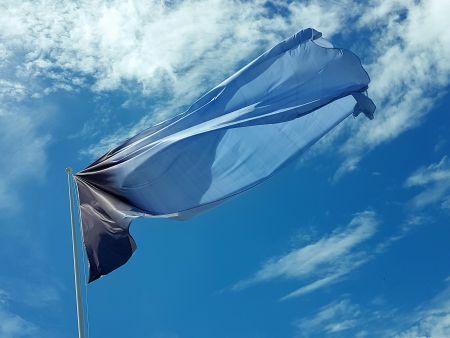 The grey and blue of the flag against the blue and white of the sky. Suddenly, that rather rationalistic concept of a flag containing all the colors of one particular sunrise, became a touching, poetic work of art. In the early hours of February 14, 2017, at Chimay, close to where he lives, Stijn Cole took an extensive series of pictures of the sun rising. One every minute, for three hours. Using a computer program the Belgian artist afterwards compiled all the pictures into a visual timeline; one image reproducing the colours of that entire sunrise, of that morning. It’s a simple, wonderfully poetic work that can be regarded as the key work for 1:1, the summer exhibition Cole assembled for the Chimay castle (last day, Sunday July 30). He is the fifth artist to be invited to the castle, after Marie-Jo Lafontaine, Hans Op de Beeck, Koen Vanmechelen and Jean-Luc Moerman. As the other works of art in this small exhibition (comprising a couple of drawings, sculptures and a subtle dialogue with work by Marthe Wéry) will tell you: Cole sees himself as an artist working in that century-old tradition of landscape painting, focusing on colour, light and time, as a modern-day impressionist, combining abstract and figurative work. A wonderful bonus will be waiting for you, at the end of your visit. You’ll be rewarded for making the trip to this castle, when the doors open to probably the cutest, tiny opera house you’ve ever seen. You won’t believe your eyes. 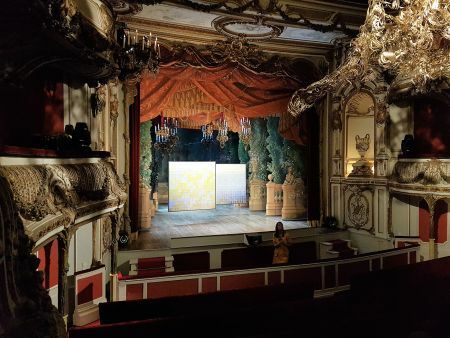 On stage: two paintings by Cole, representing the colours in a photo of Sankt-Gilgen, the place where the princess of Chimay spent her holidays as a child. Can’t make it to Chimay? 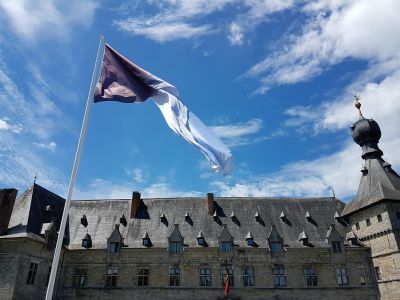 Then go to Ghent, where a similar flag is waving at the Designmuseum, until September 17, as part of the “occupation” of a part of the museum by the artist collective 019. Or wait for September, as Cole is currently preparing two exhibitions. One for his gallery, re(D) in Antwerp, opening September 10, and one at C-Mine (Genk), opening the same day. Meanwhile his work is also featured in the group show Celibataire Divas (Hasselt, through September 3) and the El Camino group project, at KADOK, Leuven (through August 13). You’ll find more work by Stijn Cole on his website, here. This entry was posted on July 26, 2017 at 17:07 and is filed under art, contemporary art, drawing, painting, sculpture. You can follow any responses to this entry through the RSS 2.0 feed. You can leave a response, or trackback from your own site.